Pyongyang, July 31 (KCNA) -- The Park Geun Hye-led regime of south Korean is becoming ever more frantic in its smear campaign against the DPRK by hurling "defectors from the north" into pulling up the DPRK over its "human rights performance." As known, the puppet regime has hosted a plot-breeding UN "office for human rights performance in the north." It faked up the "2015 white paper on human rights in the north" peppered with lies and fabrications presented by human scum to malignantly slander the dignity and social system of the DPRK. It sponsored a series of farces against the DPRK such as international meeting, seminar, briefing and photo exhibition dealing with the "issue of human rights in the north" in south Korea and abroad. There it let the riff-raffs that defected to south Korea make "testimonies" to distort the actual human rights situation in the DPRK and run the whole gamut of invectives tarnishing its image. It is scheming to inveigle more "defectors from the north" living in foreign countries into its smear campaign against the DPRK by persuading them to come to south Korea. It is also getting undisguised in using human scum as a shock brigade for escalating the "confrontation of social systems" and realizing "unification by absorption". Not content with hurling die-hard "defectors from the north" into smear campaign against the DPRK, it is militarily training the youngsters it lured and abducted, imbuing them with confrontational spirit. It frequently let human scum make "testimonies" at the "National Assembly", saying "human rights performance in the north is the world's worst." It is escalating its confrontation with the compatriots in the north to an extreme pitch by setting up an "office for storing north's human rights records" and funding the anti-DPRK human rights conspiratorial bodies. The Park regime is, indeed, the one of the worst human rights abusers as it is instigating the citizens of the DPRK it took to south Korea through appeasement and deception and by force to escalate confrontation with the DPRK. All the preceding chief executives of south Korea resorted to conspiratorial racket against the DPRK, but there was no such confrontation maniac as Park who made it a state policy to use "defectors from the north" as a shock brigade that plays a flagship role in stoking "confrontation of social systems" and realizing the "unification by absorption", and worked hard to carry it out. "Protection of human rights of defectors from the north" much touted by the Park regime is no more than a sly artifice to get a "legal justification" for the crimes it perpetrated by luring and abducting citizens of the DPRK. Lurking behind the regime's base moves is its sinister design to tarnish the image of the dignified DPRK under the pretext of "human rights issue" and realize its wild ambition for "unification by absorption." However, it is no more than a pipedream of psychopaths that can never come true. Poor, indeed, is the plight of the Park regime that has to use even human scum. Pyongyang, July 31 (KCNA) -- Minju Joson on Friday carries an article of a military commentator critical of the U.S. and south Korea's shameful farce on the occasion of July 27. When the world sent hearty congratulations to the army and people of the DPRK, the U.S. and south Korean puppet group ran the whole gamut of gimmick to get rid of disgrace and infamy as wretched losers, the article says. A farce in Washington began with an event called "memorial wall". The "memorial wall" was a "brainchild" of U.S. Congress to build a wall just as an endless long fence surrounding a cemetery as it was thought impossible to engrave all the names of the U.S. imperialist aggressors who were dead, crippled and went missing in the Korean war on a plane board. When the public was against the engraving of the names that totaled 36 574, the tricksters suggested an unusual event of "calling the names" in a bid to turn the public in their favor. "Name-calling" place was the "Korean War Memorial Park." The aged suffering from nightmares every July 27 had to gather there for four days to hear the names of the dead, rubbing their eyes and yawning. The tricksters decided to hold a ground-breaking ceremony for "the monument to entry into the Korean front" in a national park of San Francisco on July 11. The reason was that a "golden gate bridge" symbolic of San Francisco was the last thing the U.S. imperialist aggressors saw in their mainland before they were dispatched to the Korean war. The farce-makers also decided to hold a ground-breaking ceremony for a two-meter-high "monument to the battle in Lake Jangjin" in Virginia on July 27. The bitter defeat divisions of the U.S. imperialist aggressors sustained in Lake Jangjin during their northward advance, being seized by aggression and war hysteria, was a continuation of horrible nightmares unprecedented in the U.S. history. The number of those who were frozen to death in Lake Jangjin was much more than that of those who were shot to death. No wonder, survivors from the battle were so fear-stricken that they recalled time and again that the cold in Lake Jangjin was the most severe one in the world incomparable with that in the North and South poles. As far as the "heroes of Lake Jangjin" highly praised by the U.S. are concerned, they are no more than forlorn wandering spirits as their remains have long been left as food for dogs there. Park Geun Hye, to chime in with the above-said U.S.-sponsored farce, dispatched Kim Mu Song, representative of the "Saenuri Party," as her "special envoy" to the U.S.
During his visit to the "village for warriors of services" in the U.S., Kim went busy flattering the U.S., making deep bows even with his nose close to the ground here and there, saying Koreans have an old custom of making deep bows in token of their "respect" and "gratitude." He even visited the Arlington National Cemetery, where others hesitate to go, to pay condolences to the dead in the Korean war. There he talked such nonsense as "invincible and unparalleled alliance" and "Washington political party diplomacy." Great irony is Park Geun Hye's behavior. Park reportedly seemed to be so anxious about her dropping behind Kim in the "race of loyalty to the U.S." that she even lost her appetite as honey-tongued Kim perfectly curried favor with the U.S. during his visit. The puppet regime has opened a "special exhibition." The thing that plays a leading role there is just a newly made piano. It is said that the piano's strings are made from rusty hedgehogs that had been set up along the 38th parallel by melting it. 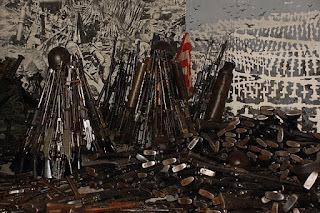 The puppet regime once made the "medal for veterans", a scrap iron medal, by melting pieces of "rusty hedgehog" that had been installed along the Military Demarcation Line. Ringing out from the piano with "rusty hedgehog" label, the only one in the world, will be only a funeral song filled with sigh resulting from ignominious defeat. The puppet regime also sponsored a "ceremony" to which it invited those of the U.S. allies that had participated in the Korean war and their 150 odd family members. There it conferred "orders of merits" upon four of them, living corpses who could remain alive as they took to flight pell-mell from battlefields of the Korean war they had gone to make a petty amount of dollars. The regime seemed to have calculated that such a farce might convert the nightmare of their defeat into a glorious "victory." Those who orchestrated the farce made no scruple of doing such base acts as to provide youngsters with the baton of defeat, as evidenced by the fact that it invited 100 odd school youth and children from the U.S. satellite countries to a "ceremony for peace camping" and incited war fever among them. The camping took place allegedly for "peace-making" but, in essence, it was one for eulogizing the Korean war as the sacred one for "defending freedom", "consoling" the souls of those who met ignominious deaths in an alien land and praising the "victory won at considerable sacrifice". The bluffing made by the U.S. that it would occupy the whole land of Korea in just 72 hours turned into the sigh of loser who suffered only shame and defeats for 1 129 days, not just for 720 days. The U.S. activated one third of its imperialist aggression forces, one fifth of the air force, most of the Pacific Fleet, the mercenary troops of its 15 satellite countries, tens of billions of U.S. dollars worth of military spending and tens of millions of tons of war supplies but could not but sign the surrender document. Its history of defeat can never be rewritten. The more frantically the U.S. and south Korean puppet forces cling to the poor burlesque on the occasion of July 27, the more glaringly they would reveal their despicable nature as losers. Pyongyang, July 30 (KCNA) -- Rim Hyon Su, Korean reverend in Canada, was interviewed at the People's Palace of Culture on Thursday. Rev. 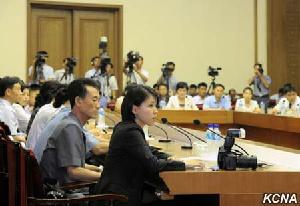 Rim was accused of making subversive plots and activities against the DPRK. Present there were officials concerned, Korean media persons and those of the General Association of Korean Residents in Japan, foreign correspondents, staff members of diplomatic missions here and overseas Koreans staying in the socialist homeland. The DPRK's relevant organ arrested Rim who acted as a servant of the U.S. imperialists and south Korean puppet group. He malignantly hurt the dignity of the supreme leadership and social system of the DPRK and resorted to subversive plots and activities in a sinister bid to build a religious state in the DPRK while frequenting it under the guise of "humanitarian aid" and "free donation" over the past 18 years. He confessed to all his crimes in the course of the investigation by the competent organ. He spoke first at the press conference. He said that he illegally entered Pyongyang via Rason City in violation of the DPRK's emergency measure to prevent the spread of Ebola in last February. He is, therefore, under legal investigation by the DPRK's relevant organ as his hostile acts against the DPRK overseas were brought to light in the course of investigation, he noted. I delivered a "report on what is going on in north Korea" before tens of thousands of south Koreans and overseas Koreans at sermon on Sundays at my church and during preaching tours of more than 20 countries including Canada, the U.S., south Korea, Japan and Brazil. Each time I malignantly slandered the dignity and social system of the DPRK. At various kinds of religious meetings including Kimnet, a group of leaders of overseas compatriot church and missionary organization in North America, and the world's south Koreans missionary meeting, I made preachment and gave lectures that "north Korea should be collapsed with the love of 'God'", fanning up hostility toward the DPRK. I persistently conducted anti-DPRK missionary activities in a bid to collapse the worship for the leader kept in the hearts of the people in the DPRK and disintegrate and destroy it from within. I made sure that food jutes "donated" to different parts of the DPRK were intentionally drawn the Cross and used to send them written on church name and bible phrases and clauses. I went round different parts of the DPRK in the name of "aid" in a bid to overturn its social system by taking advantage of the hostile policy against it sought by the U.S. and the south Korean authorities and set up a base for building a religious state. I fanned up distrust and hostility toward the DPRK among churchmen and the society of compatriots with fabrication and false propaganda. I sent despicable photos I took in the DPRK in a secret way to my son. I made sure that my son made opposition literature including video titled "North's reality", and briefed on the fact before churchmen and posted it on his website. I secretly photographed the old bible and hymns of So Kye Ok, Korean living in the U.S., in around 2007 and committed such fraud that I collected them from people of the DPRK believing in religion. I took active part in the operations of the U.S. and the south Korean authorities to lure and abduct DPRK citizens and in their programs for "aiding defectors from the north." When meeting the U.S. ambassador to Mongolia in 1996 I discussed the issue of helping over 500 "defectors from the north" go to south Korea via Mongolia every year. I received a GPS marking an area of the boarder of Inner Mongolia, China from Dennis Kim, south Korean in the U.S., involved in alluring "defectors from the north", and handed it to a "Korean broker defected from the north" at Beijing Airport. I made outlay for supporting "defectors from the north" from the church budget for two years since 1996 and dispatched Canadian believer Jon Jong Sok to Yanji and Tumen areas in Jilin Province of China to allure DPRK citizens to "defecting." Rim Hyon Su honestly admitted all crimes perpetrated by him were aimed to overthrow the state. He answered questions raised by reporters. He referred to how he was checked and arrested by a law enforcement organ of the DPRK and laid bare the vicious and hypocritical nature of the U.S. and the south Korean puppet forces' moves against the DPRK. According to him, the U.S. and south Korean authorities are hurling not only politicians but all tricksters, media and websites into noisy propaganda about the "nuclear issue of the north" and the "human rights issue of the north". They are terming the DPRK a "country proliferating WMDs", "country suspected of money laundering" and "country manufacturing biological weapons". The "report of the UN Commission of Inquiry on Human Rights in the North" through which the U.S., the south Korean authorities and the West are vociferating about the "human rights issue of the north" was cooked up on the basis of false testimonies made by such human scum as Sin Tong Hyok who fled after committing crimes in the north. They bribed "experts" on Korean issues and egged them on to let loose a spate of invectives against the DPRK. The U.S. and its allied countries and south Korean authorities are strictly barring goods for civilians, even a gram of food and fertilizers from being exported to the DPRK. On June 1, Juche 104(2015) a baby home and an orphanage of peculiar style were built in Wonsan, a coast city in the DPRK to mark the 65th anniversary of International Children’s Day. The respected Marshal Kim Jong Un who regards children as kings of the country and precious treasures visited the construction site more than once, giving meticulous guidance. The Wonsan Baby Home and Orphanage have nursing room, education room, reading room for children, nature observation room, wading pool, bathroom, barber’s, clinic and other facilities that are perfect enough not to make children feel any inconvenience in their life. They are also provided with the geothermal cooling and heating system, outdoor playground and traffic park. Marshal suggested allowing children to cut the tape to inaugurate the facilities, so that they could always remember the day when they cut the tape with small hands to enter their home. He gave instructions which would serve as guidelines in properly managing the baby home and orphanage. He referred to problems on ensuring the best environment of life to children and on steadily enhancing the role and qualities of nurses and teachers, implanting patriotism deep in the heart of children and incessantly improving the nursing and training methods. He also stressed the need to take a responsible care of the building and facilities and thoroughly abide by health and hygienic principles. He went on how good it was to have built the fine home for children as our great leaders had desired. And he said that, following the party and country as their fatherland and mother, the children would grow brightly and cheerfully to be reliable pillars of the country. Thinking of it, he renewed his determination to shed more sweat for posterity everyday and spare nothing for them. . These days there is only one country and one leader that is totally anti-American and upholds independence . That country is People's Korea and that leader is Marshal KIM JONG UN . If you look at today's world China in its own words says "The two powers have far more common interests than differences"(Xinhua) , Iran has done a deal with the US , Cuba apparently "toned down the anti-U.S. rhetoric" at the Moncada celebrations and Libya and Iraq are no more but the DPRK has not succumbed as is as strongly anti US as before , if not even more so. 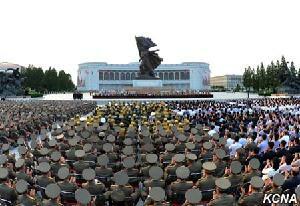 Recently the DPRK marked the 62nd anniversary of the victory in the Fatherland Liberation War . The DPRK made very strong statements including the Appeal of War Veterans of the DPRK which stated "When the time to launch a decisive battle comes, all young people across the country should turn out in a sacred war for reunifying the country to liberate the south at a breath and hoist the flag of the Republic on the top of Mt. Halla on Jeju Island! Display fireworks for celebrating July 27, the day of final victory, on the day of making a report on national reunification to the great leaders after blowing up even the U.S., the citadel of aggression!". This is the strongest ever statement from a socialist country. As a part of the programme events there was the re opening of the revamped , modernised and expanded Sinchon Ri museum. This was visited by Marshal KIM JONG UN on the 23rd of July where he said " the appearance of the new Sinchon Museum in the run-up to the victory day when the Korean people defeated the U.S. imperialists is a striking demonstration of the spirit of the service personnel and people of the DPRK and their indomitable will to glorify forever the history and tradition of victory, holding aloft the banner of anti-imperialist, anti-U.S. struggle under the guidance of the party.... No matter how crafty the U.S. imperialists become in their moves to cover up their crimes, they can never erase the traces of massacre of Koreans left in this land...we should force them to pay for the blood shed by Koreans and settle accounts with them with arms without fail"
Long live Marshal KIM JONG UN anti US leader of the present time ! Visiting south Korea and its surrounding countries from July 25, the special envoy for the six-party talks of the U.S. State of Department is misleading the public opinion to give impression that the dialogue has not been resumed due to the DPRK, asserting that the U.S. is keeping the door of dialogue open but the DPRK is reluctant to come out for dialogue and if the DPRK makes a decision to go other way, the U.S. would flexibly react to it. As can be judged by anyone with reason, the escalated tension without dialogue persists on the Korean peninsula due to the U.S. hostile policy towards the DPRK, the ceaseless joint military maneuvers for aggression, its military expression, in particular. If the U.S., not the DPRK, stops such hostile acts as joint military maneuvers and makes a decision to go other way, it will be possible to resume dialogue and settle many issues. It is the height of shamelessness and hypocrisy that the U.S. is trumpeting about "will for dialogue" and "flexibility" while resorting to military maneuvers ceaselessly. This is nothing but a petty trick to shift the blame for the stalled dialogue on to the DPRK in a bid to tide over the crisis when the public in the U.S. is becoming increasingly vocal blaming the Obama administration's failed policy toward the DPRK. Just looking at the so-called criticism , in fact slander , the DPRK supreme leader Marshal KIM JONG UN by the Western imperialists particularly by the so-called "human rights " lobby such as Judge Michael Kirby ( one wonders what discoveries will be made about him after he dies ?) . Apart from being based on false testimony of so-called "defectors " from the DPRK , it is really motivated by the fear the US have of a strong and decisive leader. 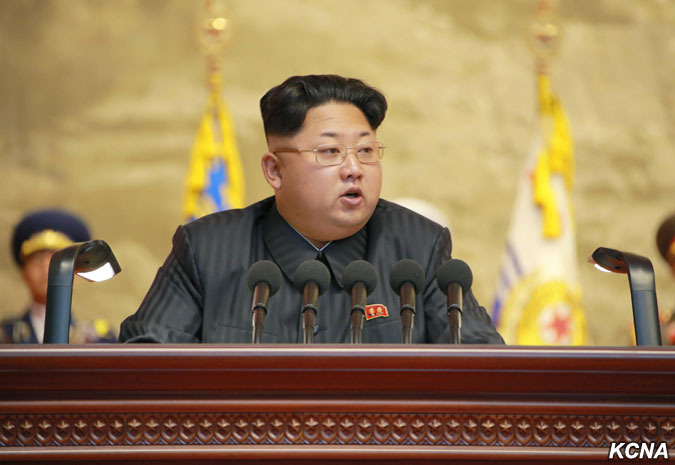 Marshal KIM JONG UN is being increasingly recognised as a charismatic figure with profound leadership abilities . To me respected Marshal KIM JONG UN is a leader who gets things done and is not afraid to criticize inefficiency and incompetence but more importantly he is a decisive leader who does not believe in unresolved issues or unfinished business. Some of the furore over "human rights " revolves around the liquidation of the head of the modern factionalist group , the traitor Jang Song Thaek , of course to hear the USA speak you would think no one was ever executed in the US and no one ever got shot by the US police ! . However the traitor had many warnings and what Marshal KIM JONG UN did was to act decisively to root out treason and did not leave issues unsettled . The DPRK will go forward to final victory under the resolute and decisive leadership of Marshal KIM JONG UN. Pyongyang, July 29 (KCNA) -- Recently the south Korean puppet group made a litany of jargons about the "settlement of the north's nuclear issue" in the wake of the nuclear deal of Iran only to invite criticism and derision of public at home and abroad. A spokesman for the puppet Ministry of Foreign Affairs and the minister of Unification of south Korea talked rubbish that "the north's nuclear issue should be ultimately resolved through negotiations" and "pressure on it would prove effective." South Korean conservative media claimed that "choice of bread instead of nukes would be a good model of settling the north's nuclear issue." South Korean media and experts went the lengths of crying out for "boosting international cooperation to lead the north to dismantling its nukes," saying that "it was only the north that remains subject to UN sanctions over its nuclear issue". These are nothing but childish remarks. Commenting on the Iranian nuclear deal, public at home and abroad is unanimous in holding that "north Korea is different from Iran and its experience is hardly applicable to the north." Alexander Zhebin, director of the Center for the Research on Korea of the Institute of Far Eastern Studies of the Russian Academy of Sciences, said, when interviewed by Sputnik broadcasting service, that "it was illogical to compare north Korea's situation with the Iranian nuclear program." "North Korea declared that it is a nuclear weapons state after conducting three nuclear tests. It also clarified that it is ready to fulfill its commitments as a nuclear weapons state. Under the situation where the U.S. is staging joint military drills with south Korea under the pretext of the north's nukes, Pyongyang will never give up its nuclear program unilaterally without any reward. On the contrary Pyongyang considers the promotion of its nuclear program as the best option for protecting its power." As recognized by the world, the DPRK is a full-fledged nuclear weapons state and its nuclear deterrent is indispensable for it to defend the sovereignty and vital rights from the U.S. nuclear threats and hostile policy that have lasted for over half a century. It is preposterous to compare the Iranian situation with that in the DPRK as it is harassed by ceaseless large-scale joint military drills and other military provocations of the U.S. and exposed to its biggest nuclear threat. This being a hard reality, the south Korean puppet group behaves like an ostrich with its head in the sand. South Korea cannot behave otherwise as it is a colonial servant of the U.S. It is the puppet group that echoes the voice of Washington like a parrot and it is the south Korean authorities who have to read the face of their American master without having their own views. When one serves a big power, one is bound to follow outsiders' mentality and one's eyes and ears no longer belong to one. How miserable the south Korean puppet group looks. The DPRK's nuclear deterrent for self-defense serves as the most powerful weapon guaranteeing the dignity of Songun Korea and national security and its position of a nuclear weapons state will get stronger in any adversity. The U.S. Department of State in its 2015 report on flesh traffic on July 27 slandered the DPRK, referring to the flesh traffic in different countries. It termed the DPRK "a source of flesh traffic," asserting that many of trespassers are sold off to flesh traffickers of other countries and it has made no effort to prevent the practice. The report went the lengths of citing misinformation about forced labor and concentration camps in a sinister bid to malignantly slander the dignified DPRK as it did in the past. The U.S., the worst abuser of human rights and biggest flesh trafficker in the world, shamelessly talked rubbish over the "human rights issue" in the DPRK as if it were "a human rights judge". This is just like a guilty party filing the suit first and a vivid expression of its hostile policy towards the DPRK. The U.S. has got corpulent through hundreds of years-long slave trade as it was founded as a result of genocide. The U.S. is vociferating about any "flesh traffic," telling sheer lies, but no one would pay heed to them. The U.S. is cooking up a flurry of such false documents as it found it hard to bring down the DPRK by force. This is a revelation of its cynical ploy to internationally isolate the DPRK by such poor method of hurling mud at its social system and a carefully worked out scenario to realize the ambition for bringing down the system at any cost. It is an unbearable insult and mockery of the DPRK that the U.S. is trumpeting about any "flesh traffic" which can never exist under the former's socialist system whereby the people are fully exercising the independent right as masters of the country and realizing their beautiful dreams and ideals.
" My noblest respects and warm and militant greetings go also to the anti-Japanese revolutionary fighters who, faithfully supporting the leadership of the great leaders, safeguarded the people's country and created the miracle of achieving victory in the war for heroic Korea, and to the war veterans attending this conference and across the country and the persons of wartime merits who defeated the U.S.-led allied imperialist forces and achieved great victory in the fierce Fatherland Liberation War"
This is indeed a most fitting tribute to the War Veterans of the DPRK who were first in the world to defeat US imperialism , the chieftain of world imperialism which had been unbeaten in more than a 100 wars of aggression. Thus July 27th is the Second Liberation day for the Korean people. Victory in the Fatherland Liberation War came about because of the Songun-based revolutionary leadership of the great leader generalissimo KIM IL SUNG and his Juche-based revolutionary military tactics. Much of the speech is devoted to recalling the immortal exploits of the War veterans who had to fight it out against insuperable odds as Marshal KIM JONG UN says the Fatherland Liberation War was "a confrontation between rifle and atomic bomb.". Dear respected Marshal KIM JONG UN points out that it is a more profound question than simply respecting veterans and recalling their exploits although this is very important in itself. With profound intellectual insight he says "There can be neither today without yesterday nor tomorrow without today." . This is indeed a wise statement . The past is the foundation of the past so the heroic exploits of the War Veterans need to be not only recalled but positively emulated and become the basis of the fighting spirit of the present generation. The main thing is for the present generation to inherit the fighting spirit and ideas of the war veterans, the revolutionary elders.
" We now possess such a force as to fight any form of warfare of the choice of the United States. We have a might powerful enough to deter the United States from unleashing a nuclear war. Gone forever is the era when the United States blackmailed us with nukes; now the United States is no longer a source of threat and fear for us and we are the very source of the greatest threat and fear for it. This is the present reality. Independence is justice, and it is an inevitable historical outcome that justice emerges victorious. Our cause is just, and no force in the world can check the advance of our service personnel and people who are marching in high spirits as they are rallied single-heartedly behind the Party, cherishing as an almighty weapon the revolutionary spirit of Paektu and the spirit of defending the country displayed in the 1950s." The victory of the Korean people over US imperialism and other imperialist forces and the south Korean puppets is inevitable because the independent cause of the the Korean people is a just one and justice always triumphs in the end ! 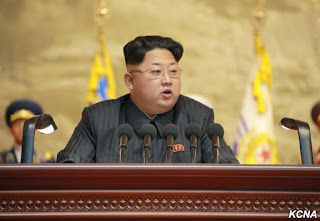 Overall the speech of the dear respected leader Marshal KIM JONG UN gives highly valuable teachings on carrying forward the great revolutionary traditions of the Fatherland Liberation War and imbuing the present generation with a revolutionary anti-imperialist figthing spirit . It is a text that deserves wide study as it greatly enriches the theory of the revolutionary traditions. On June 25, 1950 the U.S. ignited a war of aggression against the DPRK. The world watched with deep concern the showdown between the DPRK which was only 2 years old and the U.S. which had the history of aggression of more than 100 years. In the war incomparable in terms of military force the Korean army and people displayed intense heroism and self-sacrificing spirit and thus defeated the U.S. which had boasted of being “the strongest” in the world. It was really a miracle of history. All the operation plans invested by “famous generals” in the capitalist world were utterly brought to naught by the distinguished military strategies and tactics of President Kim Il Sung, ever-victorious iron-willed brilliant commander. On July 27, 1953 Clark, commander-in-chief of the UN forces signed the Korean armistice and confessed that the north Korean army could be successful because of the able commander of General Kim Il Sung. Gomes, ex-President of Portugal said, “U.S. operation plans at that time were made after repeated discussion by scores of generals who were chiefs of staff, and military experts of western countries on the side of the U.S.
General Kim Il Sung, however, crushed them alone. Victory in the Korean war was a brilliant victory of President Kim Il Sung’s ideas, confidence, strategies and tactics and commanding art. Led by Marshal Kim Jong Un, great brilliant commander of Songun, the Korean people will always emerge victorious. That is a confession made by Clerk, commander-in-chief of the “UN forces”, who signed the Korean Armistice on July 27, 1 953. The U.S. put into the Korean front a huge armed force, numbering two million together, including one-third of its ground forces, one-fifth of its air force, and the greater part of its Pacific Fleet, plus troops of 15 of its satellite countries, south Korean puppet troops and even remaining troops of the imperial Japanese army. The U.S. squandered more than 73 million tons of war supplies 11 times greater than it had spent in the pacific war. The U.S., however, suffered an unbelievably great loss in the Korean War. During the war 1 567 128 men including 405 498 U.S. troops were killed, or wounded, or taken prisoners. The loss suffered by the U.S. in the Korean War was nearly 2.3 times greater than it had sustained in the 4 years of the Pacific War. The U.S. newspaper “U.S. News and World Report” said: The loss suffered by the U.S. in the Korean War is over two times greater than all the losses it had sustained in its 5 major wars: Independent War, War of 1812, Mexican War, Spanish-American War and Philippine War. The loss inflicted on the U.S. in the Korean War was not a mere loss, but the first ignominious defeat in U.S. history. The U.S. had recorded only “victories” in its 100-odd wars in the history of more than 200 years of aggression. For the U.S. the Korean Armistice is little short of an instrument of surrender. In spite of a miserable defeat by the Korean army and people in the Korean War in the 1950s, the U.S. and its south Korean puppets held a Victorious War Ceremony in July, 2014, ridiculed by all people. Instead of feeling disgrace at the repeated defeats unprecedented in the world history of wars even in the new century, they held a ceremony, thereby revealing their miserable looks to the full. As long as we are led by the great brilliant commander of Songun, the history of victorious wars and its tradition will be long to the DPRK forever, whereas shameful defeat will remain as an unchangeable painful inheritance to the aggressors. We are greatly heartened to read this appeal issued by the DPRK War Veterans on the occasion of 62nd anniversary of the victory in the great Fatherland Liberation . We are deeply impressed by the profound militancy of the Appeal and applaud it. Basically the Appeal calls for carrying forward the traditions of the July 27 , Day of Victory in the Fatherland Liberation War and to make July 27th into a day of final victory over US imperialism ! It calls for the liberation of south Korea and the reunification of Korea saying " When the time to launch a decisive battle comes, all young people across the country should turn out in a sacred war for reunifying the country to liberate the south at a breath and hoist the flag of the Republic on the top of Mt. Halla on Jeju Island!" as well as calling for the final and complete defeat of US imperialism. The Appeal also calls for the building up of the DPRK into an even more prosperous country . Moreover it calls for a revolutionary ideological offensive against the corrupt bourgeois lifestyle and against the infiltration of imperialist culture and ideology into the DPRK. What the Appeal shows is that the DPRK is the most revolutionary and anti-imperialist nation on the earth which is battling against US imperialism externally and against the infiltration of the bourgeois lifestyle . The Appeal is an inspiration not only to the Korean people but the world revolutionary peoples . The DPRK is proudly holding high the red flag of socialism and the revolutionary banner of anti-US, anti-imperialist struggle. "Isolated " . Well the DPRK has diplomatic relations with 164 countries including the UK and has 47 embassies in other countries . Visting the DPRK in 2012 and 2013 I found myself amongst thousands of foreign visitors from all corners of the globe. At the World Juche Congress I found myself on the same table as a former Ugandan minister . Just because the DPRK does not have relations with the US , Japan, Israel and south Korea does not make it "isolated " ! "Stalinist " , a weasel word used by Western journalists to equate the DPRK with alleged events in the USSR from the period of the late 1920s to 1953. However this conveniently ignores the fact that Korea is Korea and the Soviet Union was the Soviet Union. Stalin died in 1953 . Whilst the DPRK respects Stalin a leader , it upholds Juche and has a Korean style socialist system based independence and creativity , it is not a copy of the Soviet Union (or China, Albania, Bulgaria etc ). "Repressive " also used over and over again . All based on bogus stories from "defectors" . Recently the DPRK granted a prisoner amnesty the last one being in 2012 so most prisoners will have served no longer than 2 or 3 years . In Pyongyang you only see unarmed police directing traffic . "Dictatorial " in the lexicon of imperialist journalists simply means "we don't like you very much ! . In the DPRK goverment is actually elected with nearly 100% of the vote compared to many Western countries where some governments have been elected with less than 50% of the vote !. Those leaders in the third world who toe the line but have serious human rights problems are never called dictatorial by the Western media. Nor do they refer to India as a dynasty even though it was ruled by three generations of the same family for years ! The just Fatherland Liberation War of the Korean people against the US imperialist invaders and their stooges, the Syngman Rhee clique, ended in our victory. This fact–the signing of the Armistice Agreement–is a proof of the military, political and moral defeat of the US imperialist invaders and their lackeys, the Syngman Rhee clique. Republic of Korea–and won the victory. a base of war against China and the Soviet Union. But they failed to attain their aim. The US imperialist invaders mobilized their ground, naval and air forces, armed with up-to-date technique, and even their satellite troops. But they failed to attain their sinister designs. how indomitable their fighting spirit is, and what a great vitality the people’s democratic system established in the northern half of Korea has. have acquired an increased international prestige and enjoy active support and sympathy from the people all over the world as at present. Through their heroic struggle, the Korean people and their armed forces, the glorious People’s Army, exposed to the whole world the true colour of the US imperialists, the ringleader of most savage modern imperialism. The Korean war not only smashed the myth of US “might” but also laid bare the evil nature of the idealized American-styledemocracy” which the US imperialists had tactfully kept under cover for a long time. The US imperialists incurred the anger and indignation of the freedom-loving people all over the world and were isolated from them because of the barbarities they committed against our people during the Korean war and the criminal ways and means of warfare they employed which were unprecedented in history. The military, political and moral defeat of the US imperialist invaders on the Korean front is a great victory not only of the Korean people in the struggle to defend liberty and independence but also of the freedom-loving democratic camp in the world. and its 15 satellite countries, and forced them to sign the Armistice Agreement as we demanded. This is a great victory for us. What are the victories we achieved in the arduous three-year war? …........The Korean war laid bare the brutal nature of imperialism to the world, and shattered the myth of the “might” of US imperialism to pieces. In fact, earlier some people had an illusion about the “might” and “humanitarianism” of US imperialism. Through the Korean war, however, the people of the world not only realized clearlythat the US imperialists were the most heinous savages but also came to believe more firmly that if a people fought to the last bravely, arms in hands, they would be able to defeat them. In this great struggle our people fought determinedly as one in mind under the correct leadership of the party and government and thereby withstood the harsh trials of war honourably and won a historic victory inflicting an ignominious defeat on US imperialism and its running dogs"
Greetings on FLW Victory Day ! Greetings to all Songun Idea and Juche Idea followers on the occasion of the 62nd anniversary of the Korean people in the Fatherland Liberation War against the Yankee imperialist aggressors . The victory was due to the outstanding military commanding art ,Juche-based military tactics and Songun based revolutionary leadership of the the great leader generalissimo KIM IL SUNG the sun of Juche , ever -victorious iron willed commander and gifted military strategic genius . The victory in the Fatherland Liberation War of the Korean people opened up a new era of anti-US,anti-imperialist struggle .The victory in the Fatherland Liberation made a great contribution to the world revolutionary movement . We Songun idea followers recall the indomitable heroism of the Korean people on this day . We are sure that final victory and reunification will be achieved under dear respected Marshal KIM JONG UN ! Pyongyang, July 27 (KCNA) -- The participants in the 4th National Conference of War Veterans in an appeal on Monday called on all service personnel, people and youth to bring about July 27 of the final victory in the spirit of defending the country displayed in the 1950s. Close at hand is the final decisive battle to settle accounts with the sworn enemy in the protracted showdown and have the flag of the Republic flying on the peak of a thriving nation, the appeal noted. Devotedly defend the headquarters of the revolution, the destiny and heart of the DPRK! Deeply trust and follow only Comrade Kim Jong Un single-mindedly, not abandoning revolutionary faith though you may die! 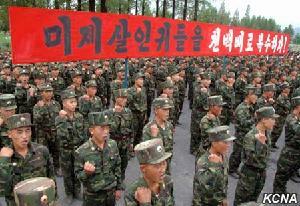 All service personnel of the Korean People's Army! Perform distinguished services in the great war for national reunification like the brave warriors in the days of the past war who dedicated themselves to defending the beloved motherland and become heroic guards who can stand proud before your hometowns, parents and teachers! Dedicate yourself to sprucing up your country to be more beautiful and stronger with your hearts burning with Kim Jong Il's patriotism, setting great store by this land defended and glorified by the President and leader Kim Jong Il throughout their lives! We, war veterans, keenly experienced ourselves in the flames of the war the justice and might of our Party's theory of giving precedence to ideology that an egg can break a rock if it is equipped with idea. As we had the death-defying spirit to defeat the enemy at any cost even by biting their throats, we shot down enemy planes with rifles and destroyed even a Yankee heavy cruiser that had boasted of being an "island" in the sea with torpedo boats. We, Koreans, made even satellites and nuclear weapons by our own efforts. Let's make the DPRK tower high over the world with our efforts and technology and resources! The beloved young people who represent the strength and dynamism of the country! The final victory like July 27 will belong to you. Don't forget even a moment with what enemy you are standing in confrontation! 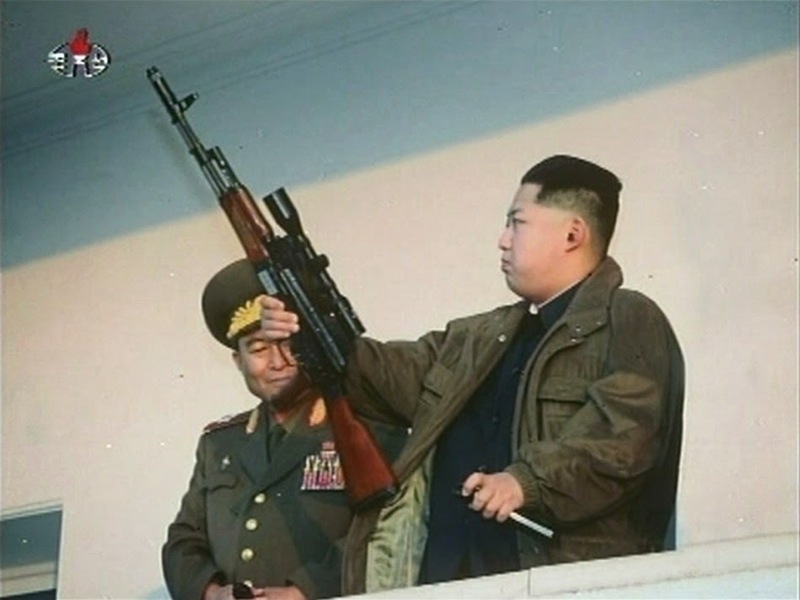 The enemy are working hard to make the youngsters of the DPRK yield to them through the spread of corrupt bourgeois life style as they failed to influence the latter with gunfire. Launch a revolutionary ideological offensive to deter the imperialists' corrupt ideology and culture from infiltrating into this land! Young people in the era of great Marshal Kim Jong Un should realize the cherished desire of the fellow countrymen and get the grudge of the nation settled! When the time to launch a decisive battle comes, all young people across the country should turn out in a sacred war for reunifying the country to liberate the south at a breath and hoist the flag of the Republic on the top of Mt. Halla on Jeju Island! Display fireworks for celebrating July 27, the day of final victory, on the day of making a report on national reunification to the great leaders after blowing up even the U.S., the citadel of aggression! The US robbers have reduced our towns and villages to ashes and are slaughtering people. The American missionaries who once believed themselves as "Apostles of God " in Korea are now bringing pregnant women together by scores and are shooting them at once with carbines , and are running over children with tanks.The gentlemen of Wall Street boast arrogantly of the "Goddess of Liberty " to the world now carry Korean girls stripped naked in cars and tanks perpetrating all kinds of outrages and atrocities against them which surpass human imagination "
Engels once called the British Army the most brutal army. During World War Two the German fascist army outdid the British Army in savagery . The human brain could not imagine more diabolic and horrible barbarities than those committed by the Hitlerite villains...but in Korea , the Yankees outdid the Hitlerites by far . Sinchon, July 26 (KCNA) -- An army-people revenge-vowing meeting took place at Sinchon, South Hwanghae Province on Sunday. They renewed their pledge to force the U.S. imperialists and class enemies to pay a dear price for their atrocities in Sinchon, and to achieve the final victory in the showdown with the U.S.
More than 60 years ago, U.S. imperialist aggressors most brutally massacred more than 35 000 innocent people in Sinchon. They dismembered people there for the mere reason that they were exemplary peasants, killed them by sawing their heads and buried them alive. They even locked mothers and their children separately, blustering that they were too happy if they were together, before burning them to death, a hair-raising atrocity. Speakers said the Sinchon Museum has become a historical place that brings to light the thrice-cursed monstrous atrocities perpetrated by the U.S. imperialists and class enemies and their crafty nature and that helps the younger generation of the DPRK have towering hatred against the U.S. imperialists and renew their revengeful will to wipe out the enemy. They said they will never forget the 400 mothers and 102 children who met miserable death with their grudge unsettled and the patriots in Sinchon who loudly chanted the slogan "Long Live the Workers' Party of Korea!" till their last breath, but force the U.S. imperialists and class enemies to pay a dear price for their atrocities. Pyongyang, July 26 (KCNA) -- A national meeting was held here Sunday to celebrate the 62nd anniversary of the Korean people's victory in the great Fatherland Liberation War. Kim Jong Il, discharged service personnel, servicemen's families, persons of merits in aiding the KPA in Pyongyang, the chief of the Pyongyang mission of the Anti-Imperialist National Democratic Front and overseas Koreans staying in the socialist homeland. Present there on invitation were foreign diplomatic envoys, representatives of international organizations and military attaches of foreign embassies here and foreign guests. KPA Army General Pak Yong Sik, minister of the People's Armed Forces, made a report at the meeting. The history of the Korean people's struggle against imperialism was a glorious history which witnessed the establishment of the tradition of the most shining victory under the most difficult conditions and its inheritance generation after generation thanks to the peerlessly great persons of Mt. Paektu. What is distinguished in the sacred course is that the army and people of the DPRK defeated the U.S. imperialists and worked military miracles in the Fatherland Liberation War for the first time in the history under the leadership of the President. 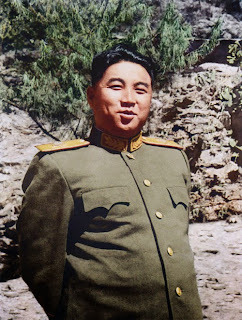 Kim Il Sung, an ever-victorious and iron-willed brilliant commander, put up the slogan "All for the Victory in the War! ", aroused all the service personnel and people to the do-or-die decisive battle against the U.S. imperialists and led the war to victory with his original strategies, tactics and war methods unprecedented in the world history of war in every period and at each stage of the war. The service personnel and people turned out as one in hearty response to the call of the President. They fought like phoenix in the whole period of the hard-fought war, firmly defending the freedom and independence of the country and inflicting upon the U.S. imperialists a shameful and bitter defeat for the first time in more than 100-year blood-stained history of aggression. The army and people of the DPRK could defeat the formidable enemy in the war thanks to the warm love for their own things and deep trust in their own strength. The tradition of the victory established by the President was successfully carried forward by Kim Jong Il, a genius of military affairs and peerlessly brilliant commander of Songun. 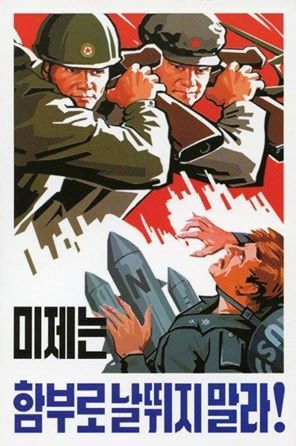 In the past years when the enemy perpetrated armed provocations against the DPRK on a daily basis, he smashed with his matchless pluck and superb strategy all the moves of the U.S. imperialists to ignite a new war such as infiltration of armed spy ship Pueblo and large-size spy plane EC-121 and Panmunjom incident and thus strikingly demonstrated the dignity and might of heroic Korea to the world. Marshal Kim Jong Un is an illustrious commander of Mt. Paektu who is glorifying the new century of Juche as the years of great victory and feats by firmly preserving the exploits performed by the President for winning victory in the war and Songun leadership exploits of Kim Jong Il. It is more than 60 years since the ceasefire on the land but peace has not yet settled on it. The past Korean war brought about the beginning of a downhill turn for the U.S. but the second Korean war will bring the final ruin to U.S. imperialism. I extend warm congratulations to you on greeting July 27, the eternal v-day for the Democratic People's Republic of Korea, our glorious motherland. And I extend noble respects to the martyrs of the Korean People's Army and the Chinese People's Volunteers who laid down their precious lives in the sacred war for the freedom and independence of the country and peace. The Fourth National Conference of War Veterans held today in grand style to mark the 62nd anniversary of victory in the great Fatherland Liberation War is a celebration meeting that demonstrates to the world the glorious tradition of victory of our country that has always emerged victorious in the anti-imperialist revolutionary wars under the command of the great leaders, and is a significant meeting that demonstrates the revolutionary mettle of all our service personnel and people to achieve a new, great victory of the great Paektusan nation by inheriting the heroic fighting spirit displayed by their forerunners. Availing myself of this significant opportunity, I extend the noblest tribute and greatest glory to the great Comrade Kim Il Sung who led to victory two revolutionary wars against the US and Japanese imperialist powers, and to the great General Kim Jong Il who achieved one victory after another in the unprecedented war to defend socialism. My noblest respects and warm and militant greetings go also to the anti-Japanese revolutionary fighters who, faithfully supporting the leadership of the great leaders, safeguarded the people's country and created the miracle of achieving victory in the war for heroic Korea, and to the war veterans attending this conference and across the country and the persons of wartime merits who defeated the U.S.-led allied imperialist forces and achieved great victory in the fierce Fatherland Liberation War. I also offer my noble respects to the veterans of the Chinese People's Volunteers who fought shoulder to shoulder with our People's Army soldiers at the cost of their blood for the freedom and independence of the Korean people and peace in the East and thus rendered assistance to our righteous revolutionary war. Our July 27 is the second Day of Liberation when our people defended with honour their country's dignity and sovereignty from the brigandish aggression by the U.S. imperialists, and also the day of proud victors that put the U.S. imperialists, who were recklessly attempting to gain hegemony in the world and enslave it, on a downhill march towards ruin. Less than two years after its founding, our Republic inflicted an ignominious defeat on the United States that had been boasting of being the "strongest" in the world, thus defending its national sovereignty and global peace and security. This was a military miracle unprecedented in the war history of mankind and a great feat of historical significance never seen before in the nation's history spanning 5 000 years. The Fatherland Liberation War, which the Korean people fought against the haughty U.S. imperialists who had battened on aggression and pillage, was in fact a hard fight that could be likened to a bare-handed man versus brigandish robbers. The world people did not anticipate that the former would emerge a winner in this war, which was in effect a confrontation between rifle and atomic bomb. Contrary to this anticipation, however, our service personnel and people safeguarded their homeland in this three-year-long, do-or-die fight, and our country became widely known as a heroic nation, a miraculous nation, that prevented the outbreak of a new world war. More than 60 years have passed since the day when fireworks were set off in celebration of the victory over the arrogant U.S. imperialists, their Stars and Stripes burning and the flag of our Republic flying high. In the long period that has witnessed changes of generations and centuries our country has been the front line of the anti-U.S. struggle, with the dark clouds of aggression and war constantly hovering over this land, and the political situation of the world changed remarkably. Notwithstanding this, our service personnel and people are demonstrating their dignity as guards of independence and our country remains a bulwark of anti-imperialist independence and peace. The United States has sustained one humiliating reverse after another since the 50s of the last century–this has become its shameful tradition. By contrast, our heroic Korea is proud of its tradition of thrillingly beating it hard whenever the overbearing power is running amuck. Our country's glorious history and tradition of victory have resulted from the Juche-oriented military ideas, adroit strategy and tactics, and outstanding art of command of the heaven-sent legendary generals Kim Il Sung and Kim Jong Il, as well as the heroic spirit and indomitable struggle of our service personnel and people who are boundlessly faithful to their Party and leaders. No force can conquer the service personnel and people who, in support of their great leader, have turned out in the struggle to defend their country with confidence in the validity of their cause and their own strength–this is a law and a truth taught by history. Our war veterans are witnesses to the strength of heroic Korea and its history resplendent with victory; they are also the country's priceless treasures representative of the era named after the great leaders. Our Party respects them not only as death-defying defenders of the country but as laudable revolutionary elders and educators who instill the spirit of death-defying defence of the country in the ranks of their successors marching forward towards final victory, and it pays high tribute to them. They are laudable heroes of our nation and genuine patriots, in that they dedicated their youth and even their lives to defending the Party, the revolution, the country and the people. The images of the generation who won victory in the war are etched in the minds of our people, including the young generation, as the sung and unsung heroes including Ri Su Bok, Kang Ho Yong and An Yong Ae, who sacrificed their only lives for their one and only motherland. But for the generation of our heroic grandfathers and fathers who blocked enemy pillboxes with their chests and became human bombs to fight against enemy aircraft and tanks in defence of every inch of the country, this dignified and powerful socialist country, where people will enjoy happiness under the leadership of the Workers' Party generation after generation, would not have existed. Time has passed and rivers and mountains have changed, but the legendary tales of feats of arms of the People's Army warriors who defeated the aggressors with the unyielding mettle and emerged victors and the bloody footprints they left can never be forgotten or erased, but are shining more brilliantly in the prospering country. The heroic fighters of the 1950s demonstrated in practice that a people strong in spirit are fully capable of defeating an imperialist aggressor army armed with even A-bombs. What our service personnel and people trusted absolutely and relied on in the confrontation with the allied imperialist forces that were numerically and technically superior was the Supreme Headquarters where the legendary hero Comrade Kim Il Sung was, and the source of their world-startling, unparalleled bravery was the ardent love for their motherland, burning hatred against the enemy and the revolutionary spirit of Paektu of fighting the enemy to the death. The U.S. imperialists, who had been boasting of the myth of their "strength," launched a series of desperate attacks by hurling colossal amounts of war materiel and even the troops of their vassal countries, but they could never dishearten our service personnel and people who were filled with trust in and affection for the things of their own; the aggressive riffraff could not but sustain staggering political and military, spiritual and moral defeats in the whole period of the war. The spirit of defending the country created in the flames of the war–this is the most powerful might that defies comparison with any physical might and the most precious asset our new generation should inherit from the war veterans who are strong in ideology and faith. The great leaders valued and held up the war veterans, who were trained and tested in the crucible of war, as the core of the Party and the revolutionary ranks. After the war, the war veterans and persons of wartime merits continuously brought the flowers of the revolution into bloom, devoting their blood and sweat unsparingly to the prosperity and development of the country, enjoying great trust of the Party and the leaders. The epics of heroic feats in the Chollima era when Koreans demonstrated their true mettle once again in the flames of great upsurge and the proud annals recording their endeavours to build a socialist power, independent, self-sufficient and self-reliant in national defence, tell of the valuable devotion of the generation of victors who faithfully supported the Party's cause, tightening their belts to do the shares of their fallen comrades-in-arms as well as their own. War veterans braved the severe ordeals of the Arduous March and forced march, always throwing in their lot with the Party both in the days of trials and the days of glory and have imparted to the rising generations the strong faith that they must invariably travel the long road of the Songun revolution following the Party. Their ennobling spiritual world is a paradigm of a revolutionary trait which everyone should learn from. It is our great pride and source of strength that we have as our revolutionary elders the war veterans, who performed undying exploits in the great war for defending the country and the gigantic socialist construction and are handing superb ideological and spiritual wealth over to the coming generations. As it has excellent people like you who, like the anti-Japanese war veterans, have gone through fire and water in support of the Party and the leader and encouraged the ranks of the people on the general onward march throughout their life with the attitude as befitting steadfast revolutionary soldiers, our Party always feels assured. The war veterans have devoted all their life to the independent reunification and prosperity of their country in single-hearted support of the great leaders and the Party since the days when they braved the flames of war. Their ennobling fighting spirit and splendid patriotic feats will shine brilliantly in inerasable golden letters in the history of the heroic struggle of our people. Glorifying generation after generation the immortal exploits of the great leaders for achieving war victory and leading the Songun revolution and stoutly carrying forward the heroic fighting spirit, the spirit of defending the country, displayed by the revolutionary forerunners including war veterans is a major strategic policy our Party maintains in its effort to put an end to the anti-imperialist, anti-U.S. showdown and hasten the final victory of the Korean revolution. The spirit of defending the country the fighters displayed in the 1950s is a great spirit of the times that inherited the revolutionary spirit of Paektu, and the spirit of Songun Korea which imbues all the service personnel and people with ardent patriotism and inspires them to achieve heroic feats. That we annually celebrate the v-day on a large scale is aimed at offering congratulations to the war veterans, revolutionary forerunners, while adding glory to their heroic life, and at firmly arming all the officers and men of the People's Army and people, including the younger generation, with the spirit the defenders of the country displayed in the 1950s so as to encourage them to the grand struggle to create a new speed of Korea. We should hold fast to the spirit of defending the country displayed in the 1950s as a good textbook for the anti-imperialist class struggle and an ideological and spiritual weapon for adding lustre to the history and traditions of heroic Korea, and fully demonstrate its might in the anti-imperialist, anti-U.S. confrontation and in the final battle for the victory in building a thriving country. War veterans, like in those days when they sang revolutionary songs in the burning trenches, picturing in their minds the Supreme Headquarters, should support the Party and the country with unabated ardour and vigor, and hand over to the coming generations the pure, single-hearted loyalty, the revolutionary faith to be kept to the death and the indomitable spirit of defending the country as their life and soul. The spirit of defending the country and the revolution displayed by the heroic soldiers in the days of the war should become the pillar of faith of all the officers and men of the People's Army, the revolutionary climate in which the People's Army absolutely obeys the orders of the Supreme Commander be firmly established as its first and foremost discipline, and ardent love for the country with which to defend every inch of the land unto death and the fighting spirit with which to annihilate the enemy without mercy pervade the battle fields and drilling ground where the campaign for winning the title of Guards Unit is underway. When the spirit of those who ensured wartime production turning belts in machines by hand and the mettle of those who dedicated themselves to increased grain production, wartime transport and assistance to the front despite enemy bombings prevail across the country, world-startling, miraculous innovations can be created one after another on all the fronts of building an economic giant, and an eye-opening reality of the whole country turning into "gold fields," "gold seas" and "gold mountains" be unfolded. Our Party attaches special importance to arming the rising generation, young people, with the spirit of defending the country. The problem related with young people is precisely the problem related with the inheriting of the revolution, and what is most important in carrying forward the revolutionary cause is to take over the lineage of ideology and faith. By cherishing the spirit of defending the country created by their forerunners at the cost of their blood, young people should respond heartily to the calls of their country as the heroic soldiers did in the 1950s; they should volunteer, with burning patriotism, beautiful hopes and great ambitions, to stand at the forefront of the Songun revolution and work at grand construction sites, and display to the full the valour and spirit of the masters of the world's youthful power and the young vanguard of the Songun revolution. Respecting war veterans as well as anti-Japanese revolutionary fighters as precious revolutionary forerunners is the trait and tradition unique to the Korean revolutionaries. We should make the social climate of giving preferential treatment to war veterans and looking after them with devotion prevail across the country so that they would feel no inconvenience in their living. By so doing, we can ensure that they, who defended today's happy life, feel pride in being participants in the Fatherland Liberation War, become more vigorous though they get older and look back on their career with pride. Now the United States and its vassal forces are making a last-ditch attempt to stifle our Republic, as they are oblivious of their ignominious defeat in the war in the 1950s and the lessons from their complete failure in the decades-long policy hostile towards our country. If the enemy, forgetful of the tradition governed by the law of history, commit another reckless act of provocation against our Republic, our revolutionary armed forces will bury them in the grave of final ruin. Our force at present is not what it was in the 1950s, when we had to fight with rifles in our hands against the U.S. imperialists armed to the teeth. We now possess such a force as to fight any form of warfare of the choice of the United States. Our cause is just, and no force in the world can check the advance of our service personnel and people who are marching in high spirits as they are rallied single-heartedly behind the Party, cherishing as an almighty weapon the revolutionary spirit of Paektu and the spirit of defending the country displayed in the 1950s. Let us all fight vigorously for final victory. North Korean "Slaves" In Russia? The "Human Rights " Lobby Need to Shut up ! DPRK does not need bailouts !